Hobbies are something that everyone needs to have in their life. They give you purpose and keep you entertained for as long as you need, as well as being a healthy distraction to just pass the time. And what better time to pick something new up now before the Summer is upon us? It's been a long Winter, and whether or not you want to admit it, we have all been in a state of hibernation that has left us all feeling rather blue - but that's enough! It's time for a pick-me-up that will put you back on track and get you ready for the delicious sun that awaits. It's fine to feel a lack of motivation at times - it's completely normal, but you can only allow it to go on for so long until you decide enough is enough, and you want to be passionate about something again. This post may contain affiliate links. Photography is a stunning visual way of capturing all of the wonderful things around you, like the magical sunsets that paint the sky all different colours of the rainbow, and the wildlife that surrounds you when you take a walk through the park. This is why you should pick up a camera and get snapping. You don't need to have an expensive high-end camera to do that with either, just go with something easy to start out with and take it from there. The warmer things start to become, the more your environment will begin to flourish, so enjoy the transition that is to come. 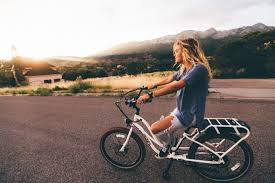 Cycling is not only great for your body, getting it ready for the Summer attire, but it's also a wonderful way to encourage you to get outdoors and explore. There is so much to see around you that you may have always overlooked because you've never had the need to go down that path, or through those trees, but you'd be amazed to find what beauty awaits you. You don't have to venture off alone either, you can buddy up with a friend and make a whole day out of exploring, with a pit stop for some lunch and a refreshing beverage to wash it down with, as well as a giggle or two. I watch way too much HGTV and am always adding to my home improvements wish list. Summer is the perfect time to learn the basics of DIY at home. Making renovations to the home can prevent wildlife infestations. Being proactive about critter control in warmer months makes the home comfier than ever. Not to mention the pride you would feel from DIY'ing those projects around the house. So stop thinking about what is to come, and instead choose something exciting to pass your time and discover a newfound thrill that you’ve always had waiting inside of yourself. Who doesn't envision spending their evenings sitting around a fire, roasting smores with a ukulele, playing some of their favourite tunes off musicianauthority? It's the ideal dream while being in the company of the ones you love most. So the sooner you start to learn a new instrument, the sooner you can make this happen. Just think, you will be able to create your very own music and share stories from the songs you've written. This is a very powerful tool that can touch so many people on a deeper level, and that's what makes it such a special thing.